Please check the animated sample image. 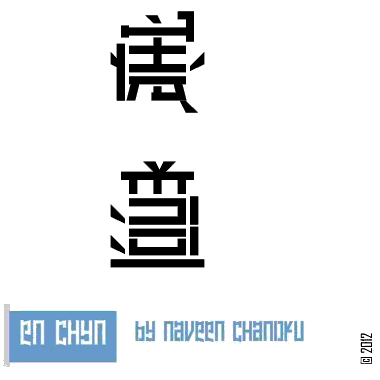 'en chyn' is a kind of Ambigram. You can create chinese like letters in english. You have to rotate through 90 deg to switch between english and chinese-like. In this way anything can be made to look like chinese. Info: Created on 11th October 2012 . Last edited on 13th October 2012. ... andI like this kind of things. Very inventive, didn't see it at first. Hi All, I have updated the sample with an animated image. Also I have updated the usage and description. It says: "ZWYCZAJNA ŚCIANA CZEGO SIĘ GAPISZ!??" which basically in Polish stands for "JUST A REGULAR WALL, WHAT ARE YOU LOOKING AT!??". Done for fun, but it could be useful as an "easter egg" in some martial arts fighting video game. This is really creative. SUPERBLY AWESOME! Just dropped 10/10 and a fave. Ah, forgot to add - the letters colored in red say "CZAJNA", when you pronounce it (in Polish, of course), it sounds almost exactly as if you said "china". Duh. This font is also very nice on the regular way, which is impressively clever. @AFT, @elmo, @four, @p2pnut, @Neoqueto, @Umbreon126: HUGE THANKS! Your comments are my driving force. Thanks. And sorry for the late reply. @Neoqueto: Thanks for you have tried this one. Between, I do not know what you mean by -- 'but it could be useful as an "easter egg" in some martial arts fighting video game' --?? Easter egg: A hidden feature like a message or a secret level or something. Congratulations! FontStruct Staff have deemed your FontStruction worthy of special mention. “en chyn” is now a Top Pick.